Ini adalah versi stabil, diperiksa pada tanggal 24 Juli 2017. Ada 7 perubahan tertunda menunggu peninjauan. 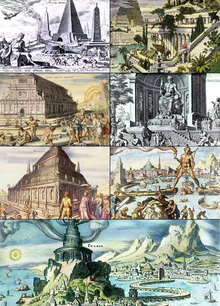 "New 7 Wonders". NewOpenWorld Foundation - a global project on to vote (until December 2005) on wonders to be included in a modern list. The World's Top 100 Wonders - a list of architectural, engineering and natural wonders by Howard Hillman, a renowned travel writer.